Unzip clean-retina-pro.zip to your Desktop. Upload Clean Retina Pro theme to /wp-content/themes/. Go to Appearance->Themes and activate Clean Retina Pro theme from Dashboard. Clean Retina supports custom menu you can set it through following steps. You can drag and drop widgets in each of positions. Note: This theme has one extra widget with the theme i.e. Theme Horse:Custom Tag Cloud. It is used to show tag clouds with beautiful button design. Try it you may like it. Clean Retina supports Custom Header Feature. Browse image from your computer and upload the image. Crop the Image according to your will. Note: If you use small image(as logo) it will appear at just right side of the header text. So, better use small image(as logo) or header text, only one of at a time, for beautiful look. But if you using big image as header image(big and not logo/small image), it will appear just below the header text. So, if you are using big image you can use both header text and image. You can show/hide Header Text(i.e. Site Title and Site Description). You can also set the Header Text Color from Text Color Option. Click on Save Changes at last. Clean Retina Pro has footer editor option to edit the copyright information. You can add custom HTML and/or shortcodes, which will be automatically inserted into your theme. There are different layouts for the home page. You can choose the homepage layout by following the instructions given Below. You can select No Sidebar/No Sidebar, Full Width/No Sidebar, One Column/Left Sidebar/Right Sidebar according to your choice. Go to Appearance->Customize/Theme Options->Design Options->Home Page Layout Options. Check on the No Sidebar/No Sidebar, Full Width/No Sidebar, One Column/Left Sidebar/Right Sidebar layout. Click on Save all Changes. Note:You have to check on Your latest posts instead of static page. in Reading Settings sub-menu page of the Settings main menu. You can select any of these above mentioned layouts, all these mentioned layouts show the latest posts in the content area. Now, you can also choose the display type for these posts(i.e. the content area-posts listing part). The display type are mentioned below one bye one. Check on the Excerpt Display Type 1 layout. Note:This display type shows the repective featured image, title, post meta information and excerpt of every posts. The size of the featured image shown is 700*290(width*height) in pixels. Check on the Excerpt Display Type 2 layout. Note:This display type shows the repective featured image, title, post meta information and excerpt of every posts. The size of the featured image shown is 330*330(width*height) in pixels. Check on the Full Content Display layout. Note:This display type shows the title, post meta information and the whole content of the every posts. This way you can embed images and videos in the content and display them on the homepage. Our Theme offers one unique homepage layout named as Corporate Layout. Below is the instruction to set Corporate Layout for the homepage. Check on the Corporate Layout and click on Save all Changes. After you choose the Corporate Layout, you can add the corporate layout content from Home’s Corporate Type Layout Options under Advanced Options Tab. There are input field to enter the image, redirect link, title and description. Upload an image, enter a title and description and give the redirect link. Note: You can add any link that could link outside of the website or link to pages,post, categories of the same website. After adding click on Save all Changes. Note:You have to check on Your latest posts instead of static page in Reading Settings sub-menu page of the Settings main menu. You can set any of your static page as home page. Check on A static page in the Front page displays option. Select the Front page: just below fromt he drop down option. There are different layouts and you can set any layout to be your default layout. Every page, post that don’t have their specific layout will follow have this default layout. Archives(i.e. category pages) will also follow this default layout. You can choose the default layout by following the instructions given below. This theme allows you to choose the specific layout for every post display and every page display. You can do so by following the steps give below. Go to Posts/Pages->All Posts/All Pages. You will see a box named Select layout for this specific Post only. in belower part below the text editor box. Note:If you don’t find it, you will see Screen Options, click on it and check the Select layout for this specific Post only. , the layout set in the Default Layout Configuration will be layout for this post as well. You can select from No Sidebar/No Sidebar, Full Width/No Sidebar, One Column/Left Sidebar/Right Sidebar to be this post’s specific layout. Update the post to save the changes. Set the number of sliders and other transition effects. Fill each input box with the Post/Page ID of the post/page which you want to use as slider. You can view Post ID by clicking Posts/Pages->All posts/pages in your Dashboard. The ID for each post/pages will be shown in right most side of screen. After filling all input box with Post/Page ID click save. Note: Slider works for the home page and static front page. Go to Galleries->Add New in your dashboard. Add Title which will be Image title. Add featured image for this post. If you have multiple images(other images too) to be shown. Repeat the first four steps again. After you are done with adding the posts in Galleries. Create a Page, give it title. On the right hand-side, click on template dropdown. Now choose this page as menu. Our theme supports Contact Form 7 Plugin i.e. there is already css written for the Contact Form 7 which would show you contact form in very simple and beautiful design. You can view the demo here. Our theme supports WP-PageNavi Plugin to show pagination. The theme already has the wp_pagenavi() function coded within the theme. The theme also has written css in the style.css file that would show the WP-PageNavi pagination in a very beautiful way. So, just install the WP-PageNavi plugin and turn off the pagenavi plugin CSS from the backend in the WP-PageNavi Setting page. You can view the demo here. Our theme supports Breadcrumb NavXt plugin. This plugin generates locational breadcrumb trails for your WordPress blog. These represent the hierarchy leading up to the current page rather than the actual path taken to arrive at the current page. The theme has the bcn_display() function coded within the theme. You can view the demo here. If you want to edit some CSS, you can follow the instructions below, your custom CSS will overwrite the theme’s CSS. In the dashboard. Go to Appearance->Customize/Theme Options->Design Options->Custom CSS input field. Write your custom CSS there. Go to the particular Page editor from Dashboard. Check the Page Title Hide checkbox. Go to the particular page on which you want to turn off the comments from dashboard. Change the Post Excerpt More Text for changing Readmore that appear below post excerpt. We support Contact Form 7. You can download it here. Create a new page and select “Contact Page Template” page template for the contact us form to show up. This theme depends heavily on Featured Images per post. Read more about Featured Images. Note: If you are switching from another theme, you will want to install and run the Regenerate Thumbnails WordPress plugin to resize your existing images. Look for the ‘Page Attribute’ option box and select the Corporate Template for it from the template drop down option. Then click on ‘Publish’ button. Now, to add the Corporate Page Template content, go to Appearance->Customize/Theme Options->Advance Options Tab->Corporate Page Template options. Choose the respective pages that you want from the pages drop down option. You need to set the featured image (Recommended size is 140px (width) * 140px (height)) for the pages that you add for the top section if you want to show the images for the added pages. Set the title. Eg: ‘Recent Work’ or as you wish. You need to set the featured image (Recommended size is 330px (width) * 230px (height)) for the pages that you add for the middle section if you want to show the images for the added pages. Set the title. Eg: ‘What Our Client Say’ or as you wish. Add the testimonial ids. To add this testimonial id, you need to create the testimonial first. So, go to Testimonials->Add New. Fill out the testimonial with Title(Name), content and other testimonial details just below the main editor box. Publish it. Now, go to Testimonails->All Testimonails. You will see the respective id of all testimonials at the last column. This is the id that you need. Add the testimonials id in the Corporate Page Template options. Click on ‘Save all Changes’ button. 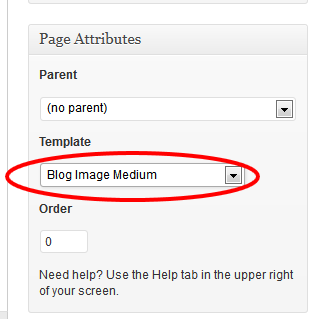 Create a new page, give it a name for example “Blog”, look for the ‘Page Attributes’ option box and select page template from Template dropdown. Choose “Blog Image Large” for large image with excerpt text, “Blog Image Medium” for medium image with excerpt text and “Blog Full Content Display” for showing Full content. Now all your posts will be shown as per your template selection. Remember the images for each of the post shown in blog layout are featured image for that particular post.